Luigi Radice is a truly innovative pipe-carver. One usually associates innovation with the fresh ideas of a young mind. Not so, in this case. Radice is also one of the oldest Italian carvers that still actively pursues his craft. Though his styling is neoclassical, his interesting stem work and his unusual approach to staining set his pipes apart. Luigi Radice began working with pipes in the Castello factory, which was not far from his home near Cucciago, in northern Italy. Castello was at the forefront of the Italian pipe making revolution in the 1960s and is considered by many to be the birthplace of the Italian neoclassical style that has since come to typify the style of Italian high-grade pipes during the last quarter century. In 1968, Luigi Radice and Pepino Ascorti, who had both worked for Castello, founded Caminetto. Caminetto continued very much in a style similar to that of Castello and became one of the key brands in the early Italian pipe renaissance. Though Castello was first responsible for the creation of a new method, a focus on craftsmanship, artistry and style, in the 1950s, it was the dedicated work and skill of Radice and Ascorti on Caminetto that truly broadened that into a larger movement. With Luigi Radice's key involvement in two of the most important early high-grade pipe makers, Radice built himself a reputation as one of the most significant characters in the development of the new style. Ten years later, he left Caminetto over disagreements with Pepino Ascorti and founded the Radice brand of pipes. 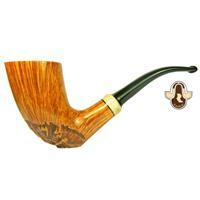 For the first time, Luigi Radice would have a pipe line with his esteemed name on it. Today, Radice pipes are made by Luigi and his two sons, Marzio and Gian Luca. All Radice pipes are made entirely by these three men on the ground floor of Luigis home. Renowned for his innovation and inventiveness, Luigi Radices pipes are truly individual. Not only are they distinct and unique, but they also exhibit remarkable craftsmanship and attention to detail. At their reasonable price, these are superb pipes. Indeed, Radice's inventiveness extends beyond style and form. He is also responsible for the estimable Twin Bore system. Designed to alleviate the bane of the pipe smoking experience, tongue-bite, the Twin Bore system is an improvement over previous dual bore mouthpieces in that it is designed to accept a pipe cleaner more freely. Essentially, the two bores run parallel in the stem and meet about a half inch from the tenon. Traditional twin-bore systems used non-parallel bores that diverged at the tenon and continued on to the end of the stem. Radices variation is an improvement in two ways: his design reduces air turbulence in the stem and is much easier to clean than traditional styles.